The Barbara Walker Footbridge over West Burnside Street should be ready by September. The long-planned pedestrian bridge over west Burnside will begin construction in late March and open in late September. Named for a parks activist, the Barbara Walker Footbridge over Burnside, as it's known now, will make it possible to use the Wildwood Trail between Forest Park and Washington Park without crossing Burnside at street level. The steel bridge will be fabricated on site at Supreme Steel in Parkrose and assembled on site to minimize disruption. PBOT estimates Burnside will be shut down for one weekend this August. Just as the bridge will be assembled from different sections, so the $3.2-million project is a coming together of many stakeholders and changing circumstances over time. The will of a core group of parks activists kept the project going over almost three decades. Many of them showed up at one more public meeting at the Oregon Zoo on Jan. 23 to hear details of the construction schedule, and just to check it was finally going to happen. 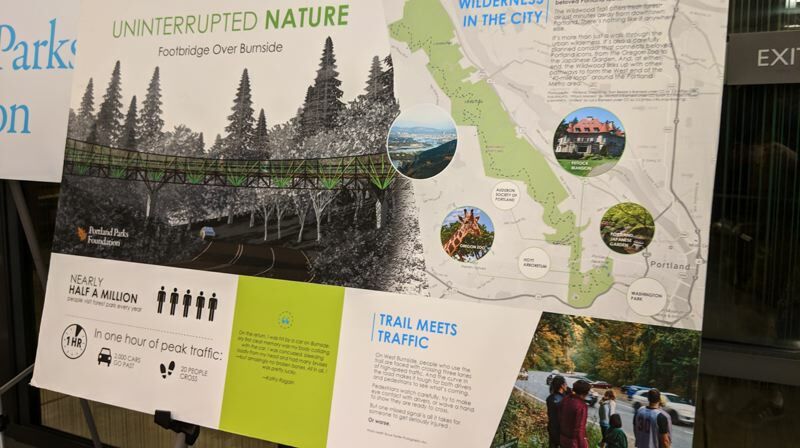 Randy Gragg, director of the Portland Parks Foundation which raises extra money for Portland Parks and Recreation, called artist Ed Carpenter's design "thoughtful" and said it has two things Portlanders love: bridges and trails. The bridge will connect "two great civic urban traditions to make an experience hikers, runners, and drivers can love together," Gragg said. Carpenter's work can be seen all over the world — particularly in airports and public plazas. His large steel sculptures often resemble woven baskets or collections of straws tumbling through the air. For the Wildwood Trail bridge, as it was first known, Carpenter set out to design a slender, graceful, almost transparent bridge. Along the way he saw how extending some elements of the sides of the bridge might make them resemble sword ferns or vine maples, familiar from the trail. But his goal was mostly structural. He worked with engineers from KPFF and once they said the bridge could stand on one pilling instead of two, the bridge became interesting in its asymmetry. Raising the money was half the story. It came in fits and starts from government but gushed from private donors — eventually. Charlie Swindells has been the capital campaign manager since January 2016. He told the Business Tribune he was surprised how well it went. "There's no comparison to how easy it was to excite donors, from large to small," he said before the meeting. Asked why, he said they were "...selling a good product. It's a beautiful bridge, and it's a badly needed pedestrian solution on the Wildwood Trail, where now the trail is cut off at one of its most important junctures. It's where Washington Park transitions into Forest Park, it's of regional importance, and for people from all over the world." With the Washington Park master plan being implemented, and the expansion of the Japanese Garden, he believes 2019 is the right year for it to open. According to Erica Heartquist, the communication manager for the Portland Japanese Garden, the newly expanded garden attracted 400,000 guests in 2018 and expects that number to be 500,000 in 2019. The 40-mile loop is a 1904 idea from the Olmstead brothers Frederick Law, Jr. and John Charles (sons of Frederick Law Olmstead). 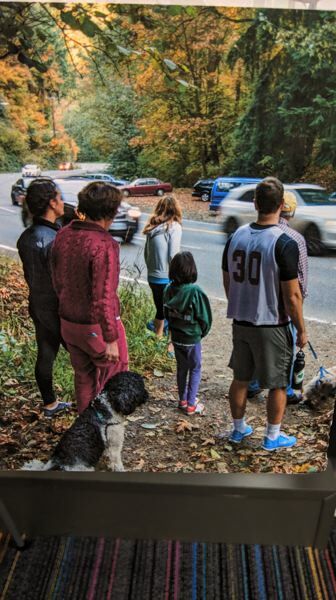 Tourists keep coming, Portlanders still love their parks, the 40 Mile Loop, which is now 140 miles, contains 30 miles of Wildwood Trail, and Burnside gets busier every year with cars trying to avoid congested Highway 26.